Gabriella and Renphlegena (Phleg for short) are two very different girls from vastly different worlds. Gabriella is an only child, Phleg is one of 12; Gabriella is quiet and well-mannered, Phleg is loud and uncouth; Gabriella has excellent diplomacy skills and Phleg can communicate with animals; Gabriella has long dark hair, Phleg’s hair is short and iridescent silver; Gabriella is a human princess and Phleg is a fairy commoner. Their two worlds collide when Phleg makes a bet with her siblings that she can last three days as a changeling in the human world. As the story opens she’s already used her magic to trade places with the unsuspecting Princess Gabriella of Fairhaven. For the first time, Phleg doesn’t have to do chores or supervise her 11 noisy siblings, while Gabriella must do Phleg’s work. As high jinks ensue on both sides, each girl learns something valuable about herself. 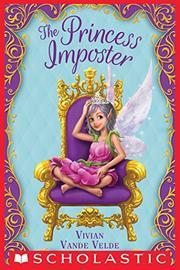 Among the fairies, Gabriella is not required to be a weak princess; she’s expected to speak up for herself. Meanwhile, Phleg allows her tough exterior to soften. Phleg provides readers with a fresh perspective on the absurdities of human propriety, while Gabriella is the frame through which readers become acquainted with fairy life and customs. The humorous third-person narration alternates between Phleg and Gabriella. Neither the human nor the fairy world appears to be racially diverse, and Phleg is depicted with a peach complexion on the cover.